PUB 365 has opened at Tuscany Suites & Casino. The venue offers a collection of 365 rotating beers and traditional pub fare with a modern spin, including homemade small bites, burgers and tacos. Located on the east end of the casino floor in the space previously occupied by Mexican restaurant and bar The Cantina, the restaurant has nearly 1,800 square feet of dining space, plus an additional 1,052-square-foot room designed for private events. The entire service team is cicerone-certified beer servers, trained to provide pairing suggestions for guests. An app-based beer loyalty program will allow diners to earn rewards based on the number of beers they try and will make them eligible to win exclusive prizes, attend private tap parties and score a personalized tap on the pub’s Founder’s Wall. PUB 365 is open from 11 a.m. to 4 a.m. daily, and lunch, dinner and late-night bites are served. PUB 365, 255 E. Flamingo Rd., Las Vegas, NV 89169, 702-893-8933, 877-TUSCAN 1. Celebrity chef Robert Irvine, host of Food Network show “Restaurant: Impossible,” will open his first restaurant on the casino floor of Tropicana Las Vegas in 2017. Attendees at a recent press conference were privy to a video that showcased what to expect from the yet-to-be-named venue; in true Irvine fashion, the chef made his entrance by rappelling 22 stories down the exterior of the resort. Commenting on his new partnership with Tropicana Las Vegas, Irvine said, "From the moment I stepped foot in Las Vegas, I have been on a mission to break into the food and dining scene. I am excited to join the city's impeccable culinary talent and I could not be happier with my decision to embark on this journey right here at Tropicana Las Vegas." Irvine is sure to bring his nothing-is-impossible attitude to the modern, American-inspired restaurant. 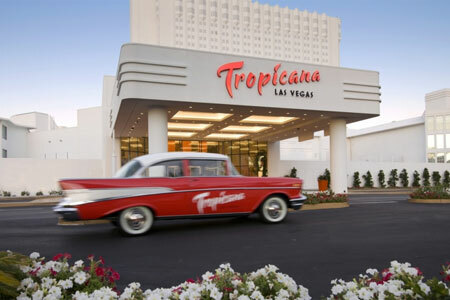 Tropicana Las Vegas, 3801 Las Vegas Blvd. S., Las Vegas, NV 89109, 702-739-2222, 888-826-TROP (8767). Burger Lounge, an eco-conscious burger chain founded in 2007 in La Jolla, Calif., has opened its first Las Vegas location at ARIA. Located on the casino floor in the former space of The Roasted Bean near ARIA’s Poker Room, selections are made with non-GMO, sustainable ingredients including grass-fed beef, organic cheeses and house-made dressings. The menu includes a free-range turkey burger made with fresh basil; an organic veggie burger made with quinoa, brown rice and zucchini; an Alaskan cod sandwich made from sustainable cod; and fresh organic salads such as the Market Chop Salad with Brussels sprouts, romaine, kale, red onion, corn, carrot, pepitas, gorgonzola, daikon sprouts and house-made dijon vinaigrette. Burger Lounge, CityCenter, 3730 Las Vegas Blvd. S., Las Vegas, NV 89109, 866-359-7757. Ten years after chef Guy Savoy made his U.S. debut at Caesars Palace with Restaurant Guy Savoy, the acclaimed chef has opened Brioche by Guy Savoy, a quick-service space similar to his successful brioche concept in Paris, Goût de Brioche. Led by Restaurant Guy Savoy’s executive pastry chef, Sebastien Polycarpe, Brioche serves “Brioninis” --- pressed sandwiches made with flaky brioche buns. Options include vegetarian; prosciutto, tomato and cheese; and chicken pesto. Coperaco Coffee Co. helms the coffee program, and the menu offers house-blended coffee, cappuccino, lattes and café au laits. Brioche by Guy Savoy is open daily from 6 a.m. to 9 p.m. Brioche by Guy Savoy, 3570 Las Vegas Blvd. S., Las Vegas, NV 89109, 702-731-7110, 877-427-7243. Wynn Las Vegas’s newest dining concept is SW Veranda, a casual outdoor terrace located above SW Steakhouse with views of Wynn’s Lake of Dreams. A selection of executive chef David Walzog’s small plates and appetizers are served, along with desserts from pastry chef Svetlana Almonte. Menu items include Wagyu carpaccio with black truffle dressing, arugula and shaved parmesan; SW lobster rolls on warm brioche; yellowfin tuna tartar with pickled Japanese vegetables, soy and gochujang; chocolate dipping fondue with strawberries, marshmallows, banana bread and crisp mini-funnel cakes; and Biscoff cookie butter cheesecake. The SW Veranda is open nightly at 5:30 p.m., weather providing. Reservations are not accepted. SW Veranda, 3131 Las Vegas Blvd. 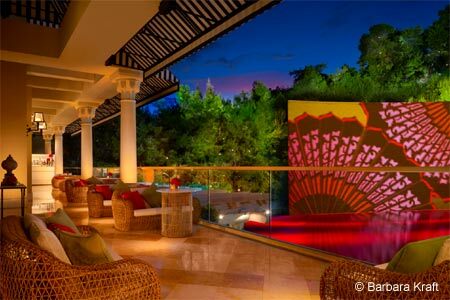 S., Las Vegas, NV 89109, 702-770-7000, 1-888-320-WYNN. Aliante Casino + Hotel + Spa has debuted The Patio at MRKT Sea & Land, a new cafe that offers outdoor dining during the warmer months. Open Monday through Friday from 11 a.m. to 3 p.m., the restaurant offers an array of appetizers, salads, sandwiches and entrées, including bacon-wrapped stuffed dates with smoked almonds, bleu cheese and a red wine reduction; shrimp orzo pasta salad with feta cheese and lemon vinaigrette; grilled chicken paillard with brown rice and steamed broccoli; and pan-seared Scottish salmon with caper lemon beurre blanc, sautéed spinach and sweet corn relish. The Patio at MRKT has an exterior entrance separate from the casino for ease of entry and exit. MRKT Sea & Land, Aliante Casino + Hotel + Spa, 7300 N. Aliante Pkwy., North Las Vegas, NV 89084, 702-692-7777. Morton’s The Steakhouse is celebrating the beginning of summer with a three-course menu available through June 26th. Priced at $45 per person, the prix-fixe menu includes guests' choice of tomato and mozzarella salad, chopped spinach salad, Morton’s salad or Caesar salad; 6 oz. filet mignon, honey-balsamic glazed salmon, chicken Christopher or shrimp scampi capellini; choice of one side; and an individual soufflé, slice of key lime pie or chocolate mousse. Morton’s The Steakhouse, 400 E. Flamingo Rd., Las Vegas, NV 89119, 702-893-0703. Bazaar Meat by José Andrés is offering a summer tasting menu for $75 per person, available from June 18th through August 31st. The tasting includes cotton candy foie gras, super-giant pork-skin chicharrón, gazpacho shots, skirt steak, butifarra spiral, Robuchon potatoes and dessert of setas al ajillo with cream puffs, plus assorted tarts and little cakes. For an additional $25, guests can enjoy a unique selection of wines paired by Bazaar Meat’s lead sommelier Chloe Helfand. Bazaar Meat by José Andrés, SLS Las Vegas, 2535 S. Las Vegas Blvd., Las Vegas, NV 89109, 855-761-7757. Ferraro’s Italian Restaurant and Wine Bar hosts a series of weekly late-night events. The traditional jazz band Jazz Workshop performs every Thursday in the restaurant’s lounge from 11 p.m. to 2 a.m. In addition, Mezzanotte Grill events take place during the same hours on various days on the restaurant’s patio. Event goers will enjoy unlimited drinks and menu items such as pizza, house-made Italian sausages and Hofmann hot dogs prepared on the outdoor grill. Each week different fare and beverages will be offered, all for $25. Ferraro’s Italian Restaurant and Wine Bar, 4480 Paradise Rd., Las Vegas, NV 89169, 702-364-5300. Lakeside, the steak and seafood restaurant on the Lake of Dreams at Wynn Las Vegas, has introduced a Hawaiian-inspired happy hour. Executive chef David Walzog has created a small-plates menu featuring favorites such as homemade bigeye tuna poke with cucumber, crisp ogo and ponzu; charred octopus with pickled daikon, hearts of palm and sea beans; pork belly with white sugarloaf pineapple, sweet chili sauce and sesame rice; ocean trout with avocado, yuzu tobiko and sriracha aioli; and Wagyu short rib loco moco with a sunny-side quail egg, gravy and sesame rice. The happy hour is offered nightly in Lakeside’s lounge from 5:30 p.m. to 7 p.m. Lakeside, Wynn Las Vegas, 3131 Las Vegas Blvd. S., Las Vegas, NV 89109, 702-248-3463. Andre’s Restaurant & Lounge at Monte Carlo is offering five- and seven-course prix-fixe tasting menus so that guests can sample multiple items from the restaurant's spring/summer seasonal offerings. Dishes include beef carpaccio with roasted Anaheim pepper coulis and sunchoke chips; pan-seared duck foie gras; king crab and spring pea ravioli; pan-seared duck breast; and hazelnut praline gateau with milk chocolate mascarpone and orange and fig ice cream. The price for the five-course dinner is $110 per person; for wine pairings, add $80. The seven-course dinner is $135; wine pairings are an additional $95. Andre’s Monte Carlo, Monte Carlo Resort & Casino, 3770 Las Vegas Blvd. S., Las Vegas, NV 89109, 702-798-7151. Celebrity chef Carla Pellegrino’s Bratalian Neopolitan Cantina is now open daily for breakfast. The morning menu includes "The Shrek Skillet" --- Basquaise-style roasted potatoes, Champignon mushrooms, spinach, Italian sausage, smoked gouda, bacon strips and three sunny side-up or scrambled eggs; a smoked salmon plate with caper berries, a split toasted bagel, whipped cream cheese and a sliced gherkin; and "The Mediterranean" --- an egg-white omelet with tomatoes, spinach, mushrooms and feta cheese. Bratalian Neopolitan Cantina, 10740 S. Eastern Ave., Ste. 155, Henderson, NV 89052, 702-454-0104. CRUSH eat, drink, love at MGM Grand will welcome attendees of the International Council of Shopping Centers RECon Convention with a three-course prix-fixe menu, available from Sunday, May 22 through Wednesday, May 25. Prepared by corporate executive chef William DeMarco, the menu will include arugula salad topped with goat cheese, caramelized hazelnuts and cranberry vinaigrette; an 8-ounce filet mignon topped with sweet onions and blue cheese fondue and served with fingerling potatoes; and “The Nutella Squeeze,” an ice cream sandwich served with chocolate whipped cream, Nutella cream and caramelized hazelnuts. The ICSC convention menu is priced at $57, plus tax and gratuity. CRUSH eat, drink, love, MGM Grand Hotel & Casino, 3799 Las Vegas Blvd. S., Las Vegas, NV 89109, 702-891-3222. From May 11 to June 18, Fleming’s Prime Steakhouse & Wine Bar will offer a four-course steak and wine dinner. Dubbed Fleming’s Rare & Bold: A Pairing Experience, the meal allows guests to explore the distinct flavors of different steak cuts, as well as the impact of aging processes. Meats are expertly paired with wines selected by Fleming’s director of wine Maeve Pesquera. Both wet- and dry-aged steak cuts are included, and the cost is $95 per person with a two-person minimum. 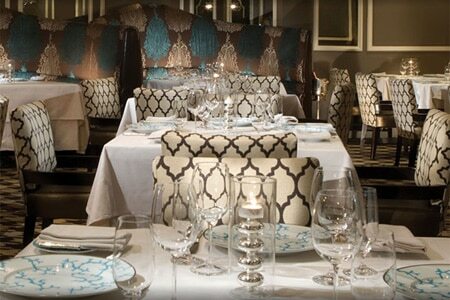 Fleming’s Prime Steakhouse & Wine Bar, Town Square, 6515 S. Las Vegas Blvd., Las Vegas, NV 89119, 702-407-0019. Several chef shuffles are in the mix for Batali & Bastianich Hospitality Group. Nicole Brisson, executive chef at The Palazzo’s Carnevino, is moving up to culinary director, overseeing all of the group’s Las Vegas restaurants. She replaces chef Jason Neve, who is moving on to open Eataly in Boston this fall. Taking Brisson’s place at Carnevino is Jon Littleton, who is vacating his executive chef position at B&B Burger & Beer at The Venetian. Elisabeth McGee will take his place; she was previously a master cook at Michael Mina Bellagio and chef de partie at Bartolotta at Wynn Las Vegas. Finally, Brett Uniss has left his executive chef position at Andiron Steak & Sea at Downtown Summerlin to become executive chef at B&B Ristorante at The Venetian. Carnevino, The Palazzo Resort Hotel Casino, 3325 Las Vegas Blvd. S., Las Vegas, NV 89109, 702-789-4141. ARIA and Takayama Management have announced that Bar Masa and Tetsu at ARIA will close on October 31, 2016. The closure comes at the conclusion of Takayama’s management agreement. Chef Masa Takayama, who has been a part of the culinary team at ARIA since the resort’s opening in 2009, is expected to open his new TETSU dining emporium in NYC’s Tribeca neighborhood this coming autumn. ARIA anticipates announcing a new concept for the adjoining spaces in the coming weeks. Tetsu, Aria Resort & Casino, 3730 Las Vegas Blvd. S., Las Vegas, NV 89109, 877-230-2742.